We love hockey and we love the game. We grew up with hockey, we sent our kids through hockey, and we still cart them across the country to watch them play. So, how did this all lead to manufacturing sports chairs with jerseys? It all started with a fund raiser at a social (a social is a Manitoba thing where people get together for one good reason or another, have fun, and sell drinks and prize tickets to raise money.) A hometown boy, Todd Davison who played for the Regina Pats of the WHL, contracted cancer that required treatment hundreds of miles away from Winnipeg. He had health coverage personally, but it did not cover travel expenses for his family to be at his side. Todd DavisonWe decided to make a sports chair out of his game worn jersey as a prize for this special fund raiser. The sports chair was a great hit and raised $2900 for the cause. But the best part was seeing the gentleman who won the sports chair present it back to Todd. The feedback was positive. We were commissioned to create a “Jets” Jersey Chair Sports Chair for their 50th Anniversary and closing of the Winnipeg Arena. 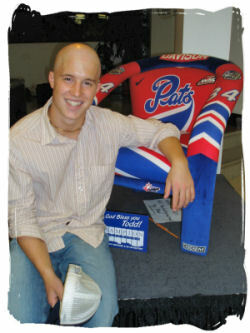 Many of the former hockey players from the Jet’s came to town for this event and signed this commemorative sports chair. We have shipped Jersey Chairs worldwide and created Jersey Chairs for events such as the Juno Cup Game, NHLPA Golf Classic, Lightning Foundation, and many more. NHLers, proud hockey parents, and others are sending us jerseys to be made into Jersey Chair Sports Chairs to be enjoyed for many years to come. There are many different ways to display your jersey and we’ve been told that a Jersey Chair Sports Chair is “the most impressive way to display a jersey.” It is our goal to manufacture a quality sports chair using our patent pending design that will present your cherished jersey in a unique way. JERSEY CHAIR CO. and the JERSEY CHAIR CO. logo are trade-marks of Jersey Chair Co. Inc. All other trade-marks shown belong to their respective owners and, unless otherwise stated, there is no endorsement by those parties of our products. The copyright in the jerseychair.com website is owned by Jersey Chair Co. Inc.